NEW! 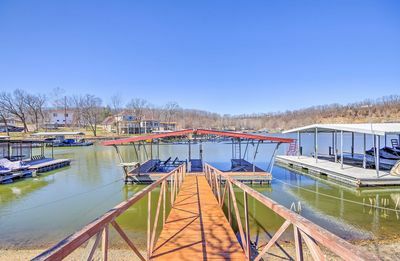 Waterfront Lake of the Ozarks Cabin w/ Dock! 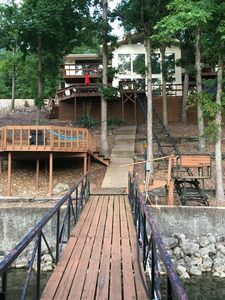 Nestled in a quiet fishing cove just a short distance from the main channel, this lakefront vacation rental cabin is the ideal Ozarks getaway for 4 guests in Camdenton. 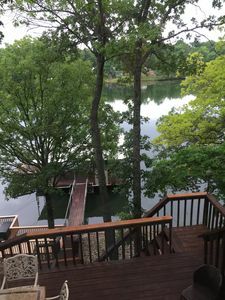 Enjoy beautiful views while barbecuing on the private double deck and launch daily voyages from the 4000-lb boat lift. 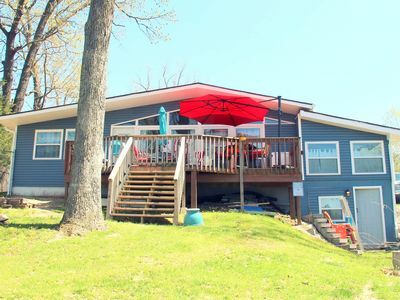 After exploring the restaurants and shopping in Hurricane Deck, return to this home's bright and airy living space with 2 bedrooms, 1 bath, and comfortable accommodations for small families or groups of friends. Upon arrival, a large open driveway provides plenty of space for 2 vehicles to park easily before maneuvering all of your luggage inside. 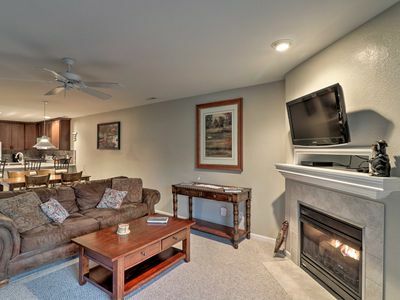 Hardwood floors lead you into the charming living space, featuring lake-life inspired decor and the modern amenities of a true home-away-from-home. 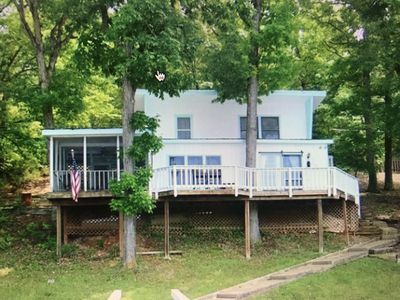 During your downtime, unwind on the comfortable sofa, hook up your Apple TV or Amazon Firestick, and utilize the flat-screen TV. When bellies start to rumble, whip up tasty refreshments in the well-equipped kitchen and set the dining table to share family meals under natural light. 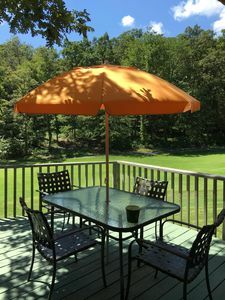 Step outside to lounge on the double deck while the grillmaster sears up a zesty barbecue feast. 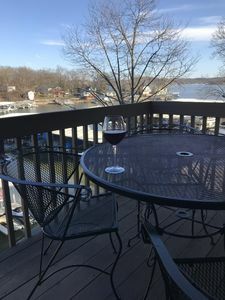 After returning from daily boat excursions with the convenience of the home's boat lift, watch the sunset beyond the water from your private deck before retreating inside for the night. 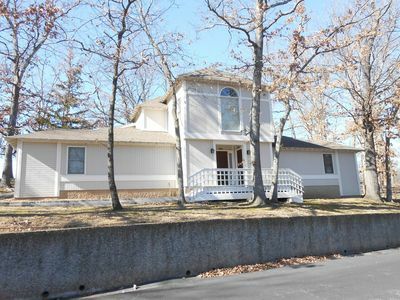 The home offers 2 spacious bedrooms with plush queen-sized beds for nights of easy rest throughout your stay. 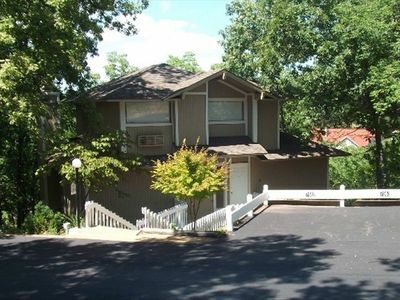 In the morning, wake up and rinse off with the walk-in shower to prepare for your next Lake of the Ozarks adventures. 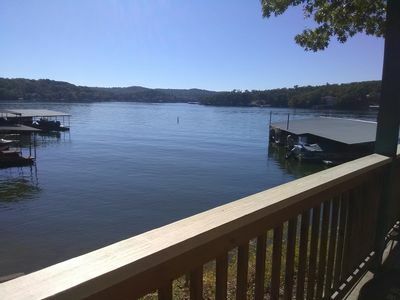 Great fishing awaits just beyond your shoreline when you travel into Laurie Cove. 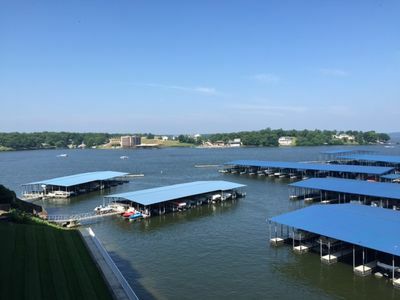 Other lakefront recreation options to try out during your vacation include water skiing, wakeboarding, tubing kayaking, stand-up paddleboarding, and much more. 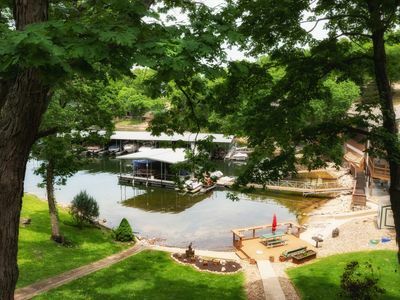 When you're looking to treat yourself at this Ozarks destination, take the boat across the lake and dock somewhere along Hurricane Deck. 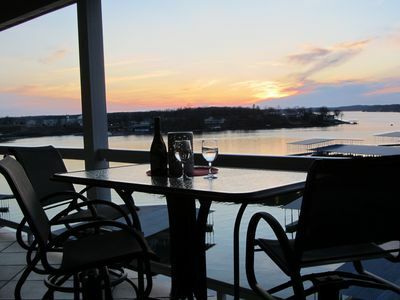 Discover unique artifacts at Josh's Antiques and enjoy waterfront dining at Captain Ron's Bar & Grill and Hurricane Dolly's. 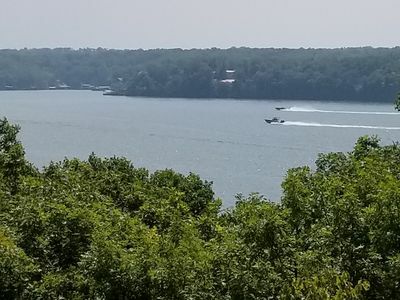 Drive a little under 30 minutes to the Lake of the Ozarks State Park for further adventures in the area, including hiking and biking trails and lantern-lit cave tours. If golf is your game, pack the clubs and head to The Ridge Golf Course and Osage National Golf Course for days on the pristine fairways. 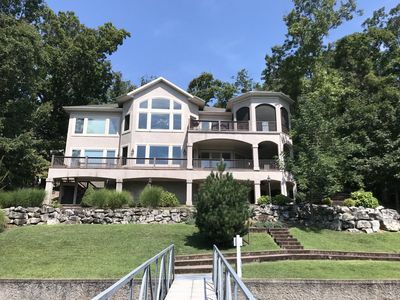 - Lakefront Camdenton location nestled in Laurie Cove with easy access to the main channel, just a short boat ride to waterfront dining, and a short drive from the Lake of the Ozarks State Park and local golf courses! 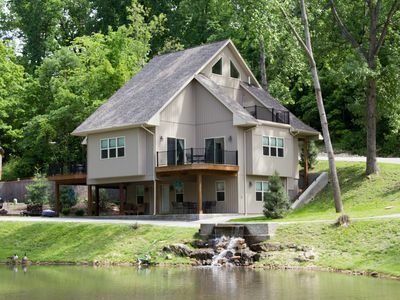 "Golfer's Hideaway" at Tan Tar A - Rent 3 or more nights and receive 1 free! 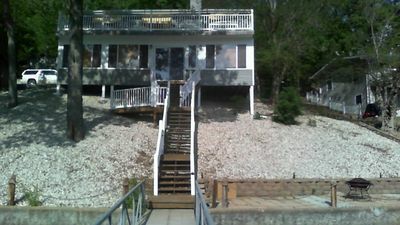 Great Condo - Bottom Floor Unit - Right On The Water! 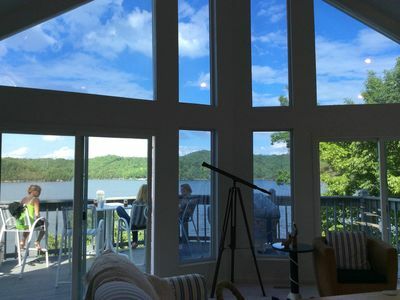 "Point of View" at Tan-Tar-A ! 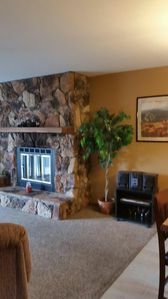 Rent 3 nights get 1 free! NEW! 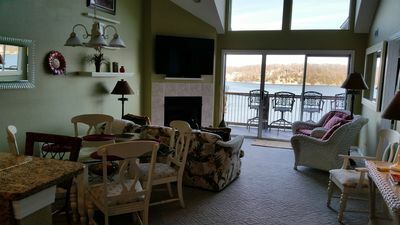 Condo w/Screened Porch on Lake of the Ozarks!